You may have forgotten by now, but two years ago the US government changed the dates for daylight saving time. When the law was passed it was set to take effect in 2007. Well, here we are. It is 2007, and Microsoft has published updates for XP, and 2003. But…No update for 2000 Workstation, or any of the server editions. This is a huge problem for many organizations. I know some companies that have hundreds of Windows 2000 boxes. The thought that they will need to upgrade to XP or 2003 (Just for this) is a nightmare. Microsoft is providing a hotfix – but only to the companies that have an extended support contract. To their credit, Microsoft does provide a registry workaround for the rest of us. The workaround that Microsoft provides is not easy to follow. Check out the KB article at Microsoft. 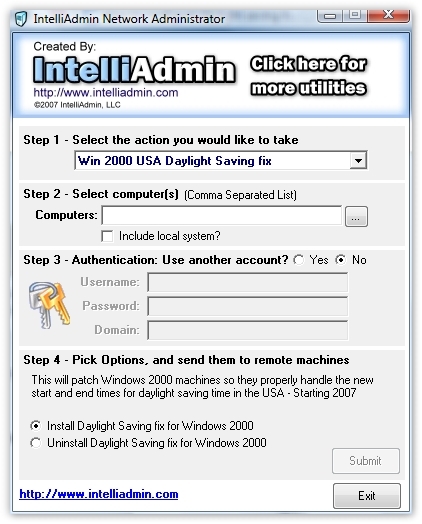 We have created a utility that will update any machine to the new daylight saving format (XP, NT, 2000, 2003, Vista). Obviously you only need it for 2000, or NT since those operating systems have dropped off support. 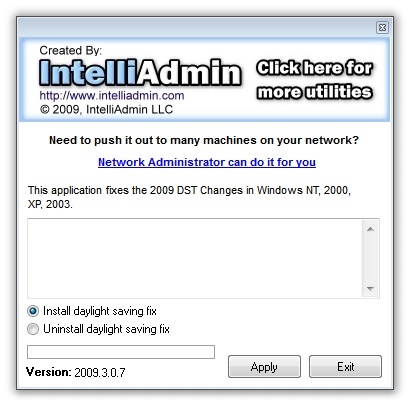 If you want to roll it out to multiple machines we have updated our Network Administrator product to install the patch. Hi, The md5 is 3db885fc509a98e4b1e7d903fa4b69f5. It executes in Vista but I get that error under NT4. does this patch require reboot? Usually yes…not because windows needs it, but because most applications are not smart enough to re-read the DST settings. 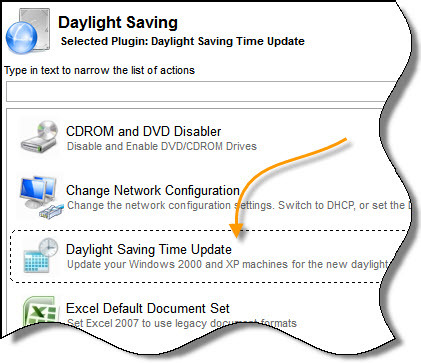 Does your DS (2009) fix include New Zealand Standard time and Australian TIme Zone changes? When trying to apply the patch to a Windows NT server, I get the error about the file not being a valid NT application file. The downloaded size of the file is 785KB. I downloaded it twice and got a file of the same size both times. Thank you for this tool, i just had to re-build a Windows 2000 server, and i was dreading hacking through the registry fix manualy.. Thank You !!!! for this patch!!!! Is there a source code for the registry changes available? I just pointed an email hosting customer to this fix, hopefully it works for him! I can’t remember how I patched my 2k box way back when, but I know it wasn’t this easy. I miss 2k, vista64 drives me nuts with its disk subsystem and unsigned driver BS. Thanks for making this fix available! Just wanted to chime in and say thank you for this. Worked great on a Win2K server we still have running. After installing the daylight saving fix on Windows XP my outlook crashes every time google calendar sync tries to sync my calendars. Please help me with this. Ive also tried the official microsoft KB942763 fix. You will need to install the latest patches for Outlook as well – it too has its own DST issues. 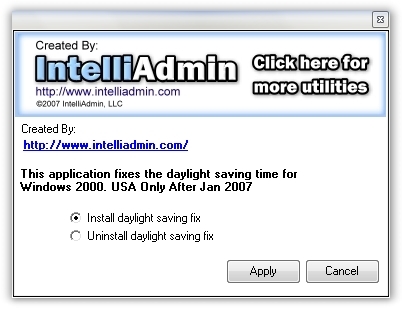 Should I leave the “Automatically adjust clock for daylight savings changes” box checked in the Date/Time Properties | Time Zone window (retrieved when clicking on the time/date in the taskbar)? Or will this cause 2K to “re-adjust” DST when the older change dates arrive later in the year? Yes If you are in a DST area, you would leave that clicked. If you are noticing that you are still an hour off after clicking this…it means your computer still needs to be patched. If your computer is already patched…it might mean your computer is joined to a domain, and the domain controller needs to be patched. Keep in mind that only Windows 2000 machines need our patch. The rest should automatically get it from MS.
I’m glad you guys are still here! I’ve used your 2000 DST patch in the past. My NT domain controller is off by an hour still… the thing is, it’s off by an hour in the other direction that the windows 2000 server I just patched and which is now correct. The NT machine has correct time if i turn off “adjust for daylight savings time”. Maybe it’s because it’s connected to a local unix time server?